Product prices and availability are accurate as of 2019-04-19 16:57:39 EDT and are subject to change. Any price and availability information displayed on http://www.amazon.com/ at the time of purchase will apply to the purchase of this product. 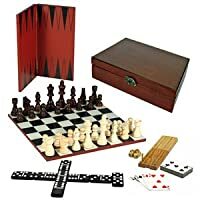 You will receive ONE (1) 15-inch wooden folding chess set by FUN+1 TOYS! (a brand of 203 Brands, Inc.). About the chessboard: The designers at FUN+1 TOYS! (a brand of 203 Brands, Inc.) have done it again! 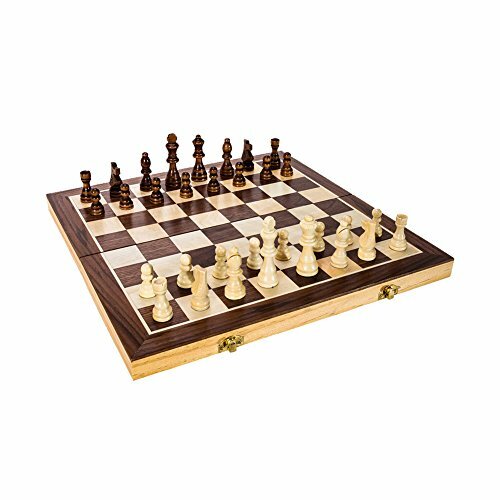 Whether a new player or Grand Master, this high quality chess board is foldable for easy storage. Unlike smaller boards, the 15" size (when open) is the perfect size for easy handling and playing -- yet not too large so that players both young and old can enjoy. Two sets of Staunton style wood pieces in individual pouches allow for easy cleanup and storage. For new players, a set of easy-to-follow instructions including diagrams is included and can be stored in the board. The box can be used to store and protect your chess board for years of enjoyment. 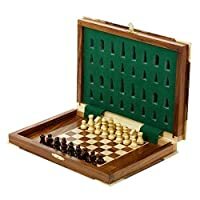 This classic chess board is 7.5" x 15" when closed. The board can also be used to play checkers and other similar games. (checkers not included). 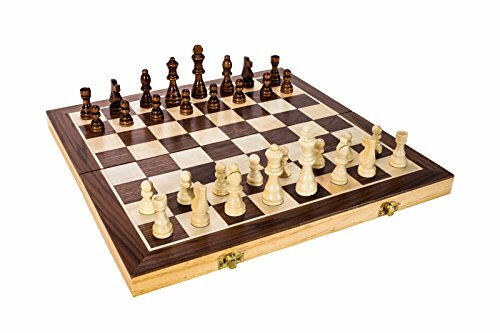 The chess set is manufactured for and distributed by 203 Brands, Inc. located in Norwalk, CT 06850. The chess set is produced in Zhejiang, China. High quality, foldable 15" x 15" chess set (when open). Storage compartment is cloth lined for style and protection. Includes simple diagrammed chess instructions for new players. Two sets of Staunton style chess pieces stored in individual pouches. Play chess on the train, car, at the park, or anywhere! Perfect for traveling!